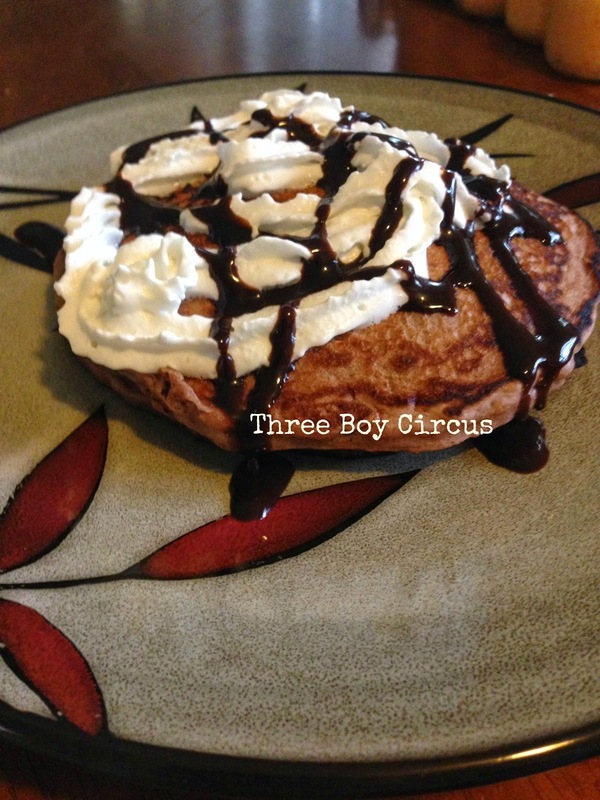 Three Boy Circus: Double Chocolate Chip Pancakes! So I've had these huge bag of Krusteaz pancake mix that I bought at either Sam's Club or Costco. Honestly, I'm more of a potatoes & eggs fan than I am a fan of pancakes.....unless we go to IHOP. I like to get their double chocolate chip pancakes! I finally decided to try using the pancake mix other ways. Now, the following attempt was not made to recreate the pancakes from IHOP. Rather, it was created as a way to use up some of that darn mix lol! And (not pictured) milk (1 3/4 cups) and sugar (half tablespoon to one tablespoon). First, you want to take 2 cups of the pancake mix and follow the directions on the back slightly. Instead of water I used milk. It just seems to make them fluffier to me. Also, I add a little more than what it says because after all, we are adding more dry mix to this too. Whisk the pancake mix and milk together in a big bowl. Now, you want to try to get all the clumps out but let me tell you, IT'S IMPOSSIBLE. And that's ok. Unless of course you have a fancy Kitchen-aid stand mixer. Then I'm jealous but also thinking your arms need a workout! Anyways, after you have mixed it well enough (or your arms are burning enough) go ahead and add in 3 packets of Swiss Miss hot cocoa. YES, I used envelopes of cocoa! Lol I didn't have any other type on hand. But don't worry; it's yummy! Try to really mix the cocoa in there, but again, you will still have some clumps. Next, you will want to add a little sugar into it. I added a tablespoon but I recommend adding it a half tablespoon at a time. This way you can stir it around and taste if it's sweet enough for you. I hope you're lucky enough to have a griddle. I attempted to make pancakes in a frying pan and let's just say the flipping of them was not fun. Get your griddle warmed up at 350 degrees. When it's ready, spray some non-stick cooking spray all across the griddle. You can use a soup ladle or any big spoon to start scooping the pancake mix out of the bowl. Depending on your preference scoop some onto the griddle slowly. Okay, so by this time, the pancakes should start bubbling and that's a sign they're ready to flip. After just a couple minutes it should be browned well and you're done! 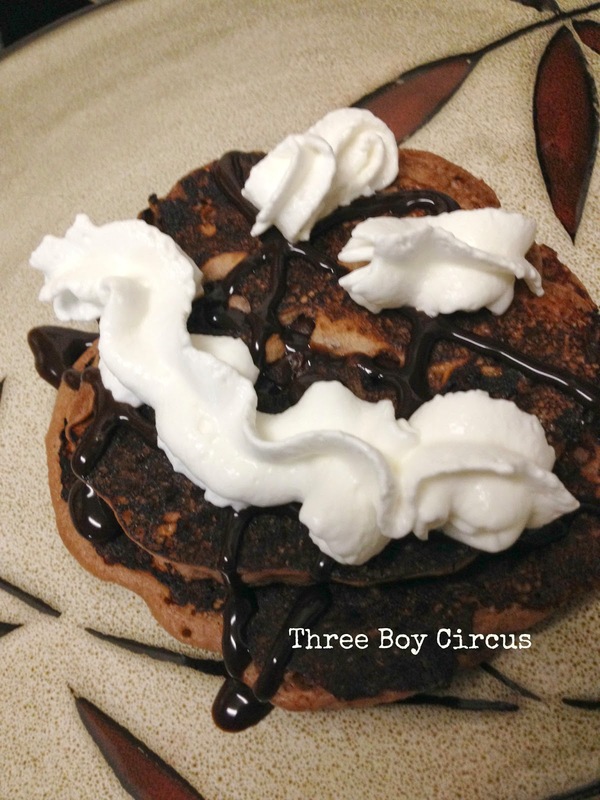 For toppings, you can use powdered sugar, chocolate syrup, and/or whipped cream. It's up to you! Blurry pic, but he was too busy eating! Oh yummy! I can totally do that and make my family so happy! Glad to meet you from UBP! Yes! Who doesn't have cocoa packets lying around!? :D Thanks for stopping by.